This cottage is a fabulous destination in Point Judith because it is within 0.5 miles of Wheeler Beach Cove and Scarborough State Beach while within walking distance of six fabulous dining/ takeout restaurants. One of these restaurants is world famous, 'Aunt Carries' which specializes in Rhode Island clam chowder & clam cakes. Private cove and fishing beaches are also within a short distance of the cottage. Point Judith is a geographical neck extending out into the Atlantic Ocean. It provides sweet, cool ocean breezes all summer This cottage is also within one mile of the Block Island ferry and the little fishing village of Galilee. Thousands of vacationers visit Narragansett every year because of the variety of amenities available. The 'Pier' section of Narragansett is the center of activity with the famous Wall which was constructed after a major hurricane to preserve the coastline. Walking the wall is a daily past time for all. Newport is close by. General Overview: Anglers Court is an adorable, immaculate, seaside cottage which is located in a great area of Narragansett. It is on a dead end street and has some water view of the Atlantic Ocean across the street. This cottage is sunny and bright, furnished attractively, and is very clean. The backyard is private as it backs up to a wildlife reserve. 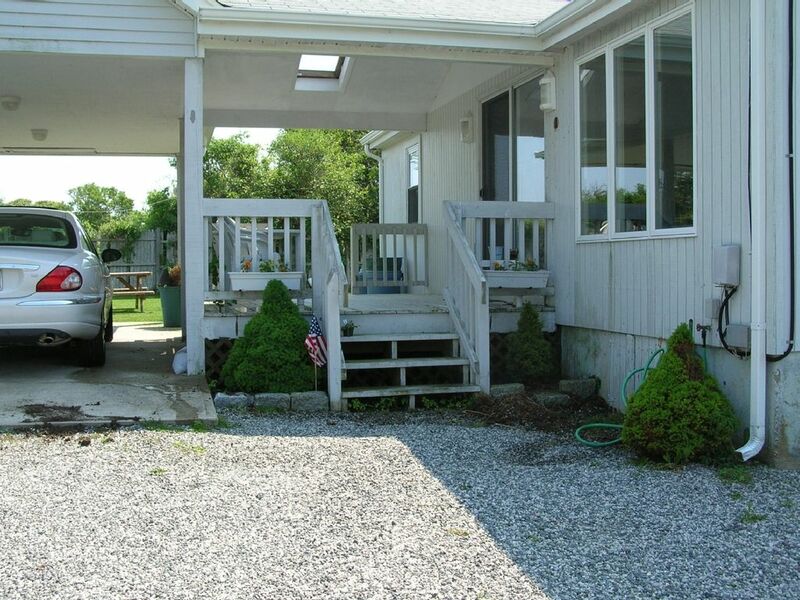 There is a carport which is convenient for bringing in packages and beach gear. Landscaping is provided for and there is a cute garden on the property. As Narragansett is a resort community, most amenities are available for recreational purposes. Newport is a major draw as well as trips to Block Island. University of Rhode Island is 20 minutes away. Kayaks are easily stored in back yard. Beaches: South County has numerable beaches for everyone's taste. There are low surf or high surf beaches. State and town beaches have life guards, food concessions, and ample parking. Sand is mostly white. Patrons must supply their own beach gear as most beaches do not have rentals of equipment. I supply 2 beach chairs and beach umbrella. There is Roger Wheeler Beach, Scarborough Beach and on Route 1A is a beautiful stretch worth visiting which is called East Matunick Beach. One State Pass enables you entrance to all the State beaches. I am a local Rhode Islander who has always loved the shore and everything that goes with it: the sound and scent of the ocean is so restful. I am a URI graduate, as well as UNH, and spent the bulk of my professional career as a high school chemistry teacher. When I retired, I obtained my real estate license and worked in rentals and sales of residential properties. I have traveled extensively including one year teaching in Yokohama, Japan. My most recent travels have been to Egypt and Israel-two countries with enormous histories in our civilization. I live in East Greenwich but holiday yearly in Antigua to escape the cold winters here. My first Art Opening was March 1, 2014. Great location. Cute and comfortable beach cottage. Private with no one in backyard but bunnies. Close to everything and quiet location. Outside shower has both hot and cold water. Vanity sink. All fixtures are in good condition. Beaches nearby: Scarborough or Wheeler are .5 mile from house. Cronins and Breakwater beach are closer. 600 ft from ocean. Ocean breezes. Partial glimpse but more noticeable outside. fans only. Cool at night from natural breeze. AC is installed for comfortable night sleeping. Not needed in summer but is in house as central heating. Please use only after washer. New. 18" but very adequate. Private back yard 2 Adirondacks with foot rests. Every renter is supplied with basic paper products and hand / dish soap for convenience. Washer requires liquid detergent. All pots, pans, and dishes are in unit. There are two steps up the deck for elderly or mobility challenged. There are no ramps. Slider comes in from deck but bedroom doorways are too narrow for wide wheelchairs. I contract with Verizon Fios for TV and internet. In general, there is no need for AC because Point Judith temperatures drop down to 60's at night. The bedrooms have table fans. This home is open and airy with the ocean just 600 feet away in the Southerly direction of the Atlantic Ocean. were an added bonus. Betty was not only pleasant but also knowledgeable and informative. Enjoyed Crazy Burger, Charlie O's, Aunt Carrie's and George's on the beach for 3pm oysters! Great getaway, great location, perfect vacation. Hope to be back! Great property with an excellent owner. We have stayed here 2 times now and love the location, cleanliness, and the home itself. Betty (The owner) keeps this home up to date and nicely furnished. The only thing I would improve is the shower, it is small and the water pressure is weak. However that would not stop us from renting again as this is a very minor inconvenience. The water pressure in the house is fine. I think the shower head apparatus will be changed and updated this year. That should make a difference. I have a great plumber who serviced the house just 2 weeks ago. The outside shower also has good pressure. We have rented at least a dozen different houses for vacations. This was one of the nicest. It is very clean, the kitchen is well stocked, the furniture was very comfortable - not the usual garage sale finds! We are a family of 4 (2 young children), and this was a perfect house for us. Nice backyard, the deck was great for eating meals, reading, playing games. Very convient location to beaches, etc.. Easy to walk a block away for dinner or ice cream. Took bike rides to the lighthouse and around the adjacent neighborhoods. Quiet at night also. Would definately rent this house again, and would recommend it to famiy and friends. This cottage is within walking distance to restaurants yet it's in a nice neighborhood. Getting to the beach is only a short drive. Our family had a great time during our week at this cottage. Betty, the owner, is very nice and accommodating. Narragansett is filled with festivals and events for the summer. The Art Festivals attract vendors and artists from the entire country. There are also carnivals and fairs in nearby South Kingstown and Charlestown. Area newspapers, the Chamber of Commerce, and free RI magazines give schedules along with web sites. Newport is also brimming with many music festivals and a wonderful selection of Art Museums which showcase local talent worth collecting. The Newport Tennis Tournament is hosted at the Hall of Fame and features world class competitions in June. Live summer theater can be found at Matunick by the Sea in South Kingstown(20 min). Children programs are usually offered. Bay cruises in both Narragansett and Newport are available. RI also has a wonderful lighthouse tour which is very picturesque. A 90 minute fast ferry will take you to Martha's Vineyard from Quonset Point in North Kingstown. Other Activities: Shell fishing in low areas will yield clams and crabs. Hard rakes are needed to dig into the sand. One area is off the Galilee escape road where you will see many people enjoying this pastime. RI Department of Environmental Management will have suggested areas to farm. Golf: Rhode Island South County has many golf ranges. The exact locations I can forward to you or may be available on your GPS system. Vacation days will be rescheduled in event of a natural disaster. Cleaning fee must be part of final payment. ($75.00) Owner's contract has cancellation policy: no refunds unless week is rebooked.